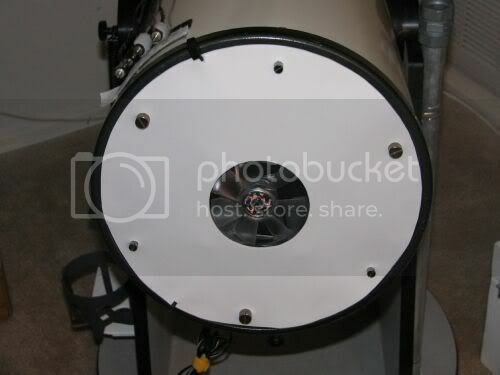 Many observers have found that installing a fan blowing at the back of the mirror of a dobsonian telescope helps to cool the mirror down to the ambient temperature faster avoiding nasty air currents. This article from Eric at Astronomerica explains why: It also helps keep up with the dropping temperature, and breaks up the thermal boundary layer on the front surface of the mirror. All of these things help to make the images in the eyepiece sharper and steadier. This installation should be adaptable to most dobsonians. Some telescopes come with a fan, but mine didn’t. It’s a Hardin 10-inch Deep Space Hunter made by Guan Sheng Optics of Taiwan. GSO now makes the Zhumell and a few other brands. I did find that once I installed the fan on my scope, as shown here, I got the sharpest views I have ever had in the telescope. Of course, if the seeing is bad (unsteady atmosphere) it really can’t do anything except prevent even worse seeing because of the telescope’s own thermal issues. If you have a Hardin, you’ll notice in the first picture that I removed the gray metal plate that comes fastened behind the mirror. You don’t need it and it actually makes mirror cooldown slower. I used an Antec Tricool 92mm computer fan. It’s a three-speed with relatively low rpm, which is good because it provides enough airflow but not enough to induce any vibration, even when using high power eyepieces. The fan should be installed so that it is blowing air toward the mirror. For computer case fans, that means the label will be facing the mirror. 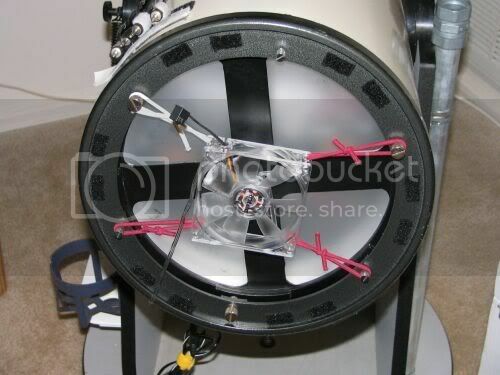 Many people recommend attaching the fan with elastic hair bands to minimize vibration transmitted to the telescope. In the picture below, you can see that I’ve just cut four bands, looped them through the fan’s screw holes closest to the mirror and re-tied them. Then I loop them around the thumbscrews used for collimation. I try to keep things simple, and this is about as simple as it gets. I used one white hair tie so it’s easy for me to tell how to orient the fan. The little black switch next to the white tie is the 3-speed switch, and I want that to be conveniently placed when I’m sitting at the left side of the scope. The 12-volt power wire extends down and to the left, and that will be plugged into my 12-volt AGM deep-cycle battery which has three cigarette plug outlets in the box I built for it. 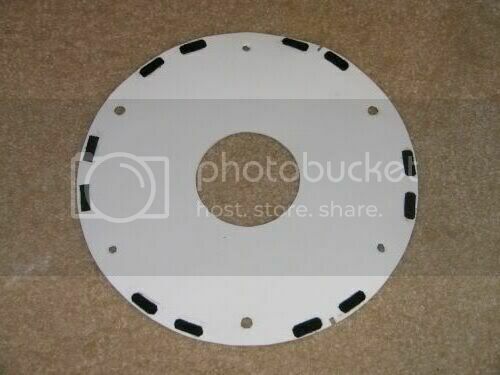 Although you can’t tell from the picture, the fan is about an inch away from the metal protective crosspiece. Don’t worry, once we install a baffle, the air will hit the mirror just fine and carry on through the gaps around the outside of the mirror into the tube and out the other end, which is how it breaks up the thermal boundary layer. The next picture shows the baffle installed. It is simply a piece of white craft foam. If you press the foam to the back of the mirror, the indentations from the thumbscrews will remain, making it easy to cut the holes for them. I glued some pieces of Velcro on to make a better air seal. The baffle doesn’t interfere with collimation. Note the 3-speed switch sticking out the notch in the upper left edge of the baffle and the notch for the power wire at the lower left. I’ll run the cord under the tube to the front of the scope where I fasten the battery box onto the base with a bungee cord.